What do you do when the weather is awful and all you want is some sun, sand and crystal clear water? Instead of spending another 5 days travelling through rainy Latvia and Poland, we jumped on google.com/flights (see how to use Google Flights) and tried to find a destination that ticked all the boxes. After a few hours of research, we found it. Mykonos, here we come. Again. 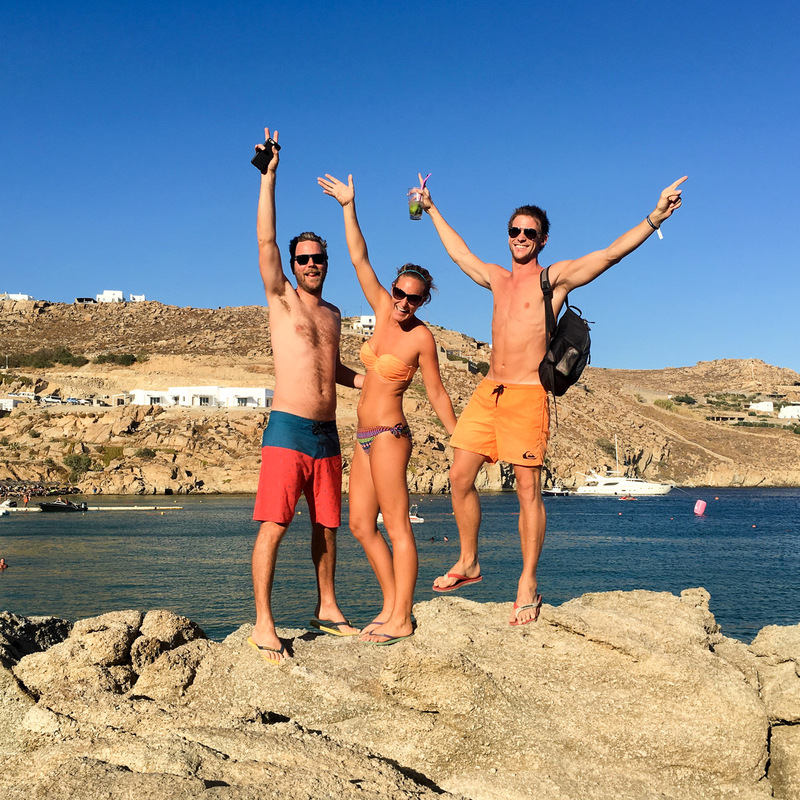 You may have seen our post from this time last year when we travelled through the Greek Islands but this time we spent the week with my brother and his 2 mates. The five of us together became a family in less than a week. In fact, according to our Mexican friend, we became the “Can-gu-ro Family” (in a Mexican accent) In case you’re confused, it comes from us being Aussies;). I believe we bounced (literally bounced) our way in and out of a few places during our time together. 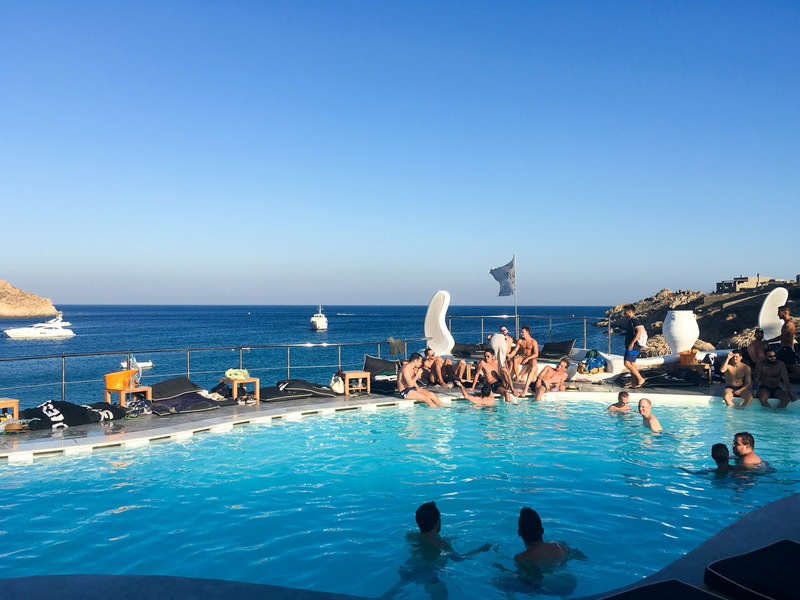 Our Mykonos week in a nutshell: The weather, perfect. The beaches, pristine. The cocktails smashed them. The food, inhaled. The company, on point. 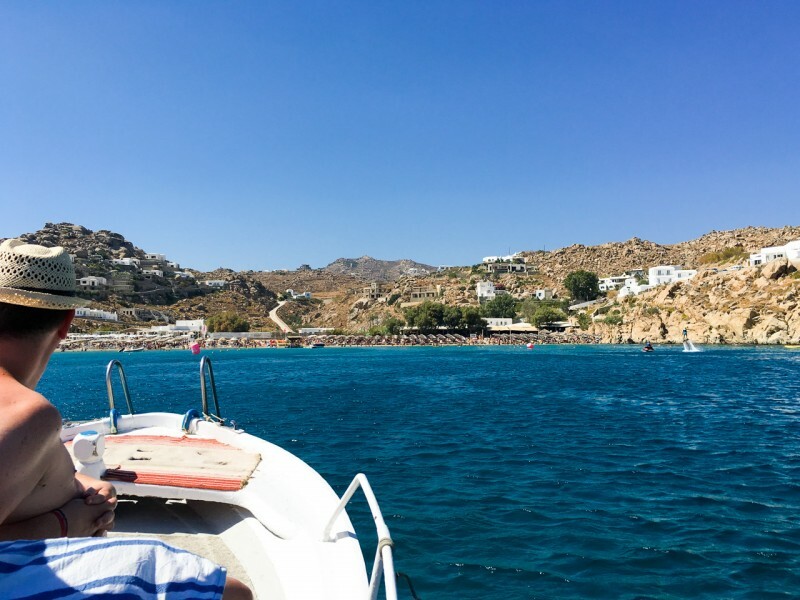 Get to Mykonos by flight or by ferry. If you’re arriving at the port, be sure to arrange a pick up from your hotel prior, it can be impossible to get a taxi. Ask the taxi drivers the cost before getting in the car, they can charge up to 40€ for a 10-minute drive. Ouch. 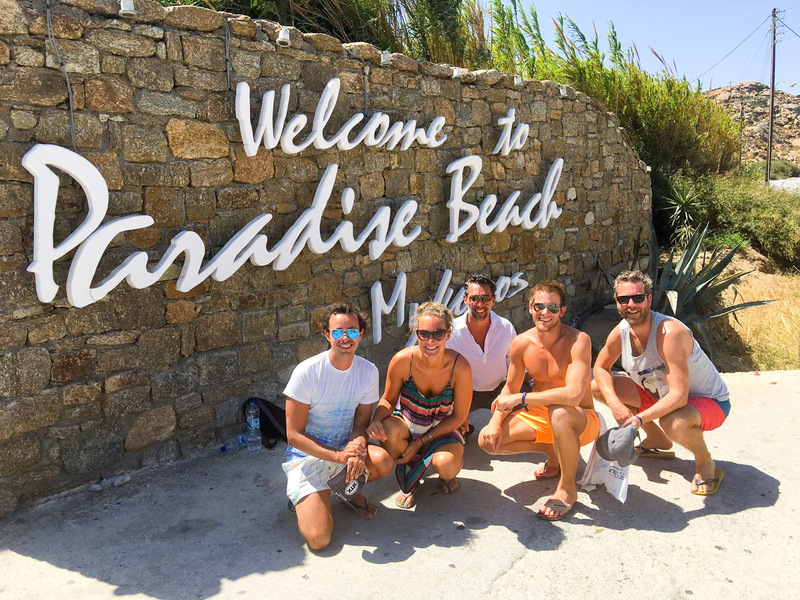 If you’re staying at Paradise Beach, request a room furthest away from the reception or you’ll feel your bed vibrating from music outside all night. 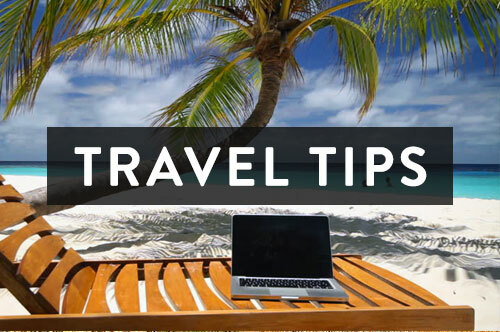 Make sure that there are transport options around you, before you book your accommodation, especially if you don’t plan to rent a car or an ATV. How long do you need in Mykonos? If you love the beach, forever! If you love to party, even longer! However, realistically, 4-5 days is plenty of time to check out the island, make a few trips to various beaches and blow up your bank account with a few nights out :). 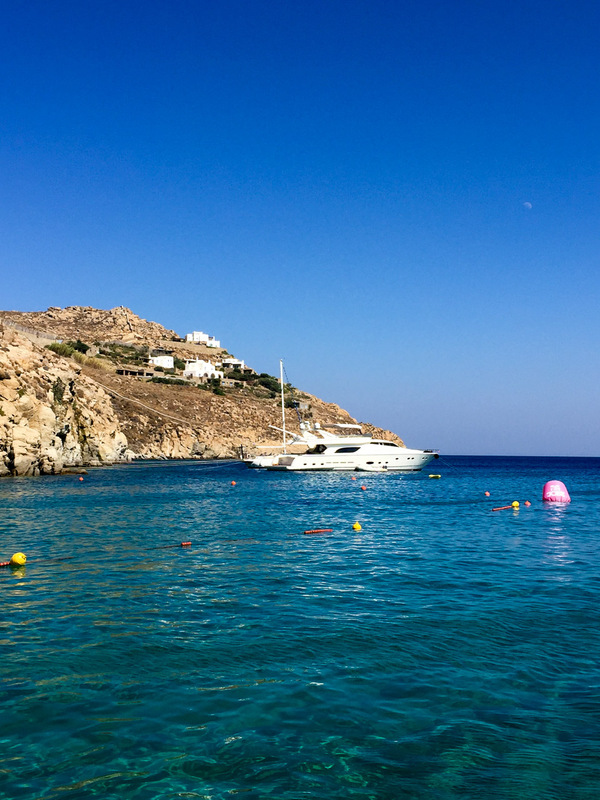 Mykonos isn’t as cheap as some of the other Greek Islands. There isn’t anywhere “wrong” to stay but it’s best to choose a location based on what you are after. Is it relaxing beach time? Time in the town? Partying? Exploring? Unfortunately, being an island, the public transport system is pretty crappy. There are only 30 taxis on the whole island, yes 30! That isn’t a lot for the millions of visitors the island gets each year. So you need to choose your location very wisely. We stayed a second time at Paradise Beach Resort and we honestly believe this is the best location for everything you need (unless you want complete peace and quiet). They have a range of options for all different budgets. There is a bus that runs to and from the town (15-20 min, 1.80€), boats that take you to other beaches, the clubs and beach parties are right there along with a small supermarket, laundry services and the beach at your doorstep. The only downside? The noise! If you want to stay near Paradise Beach but slightly away from the noise, Paradise View Hotel is on the cliff away from the main clubs. 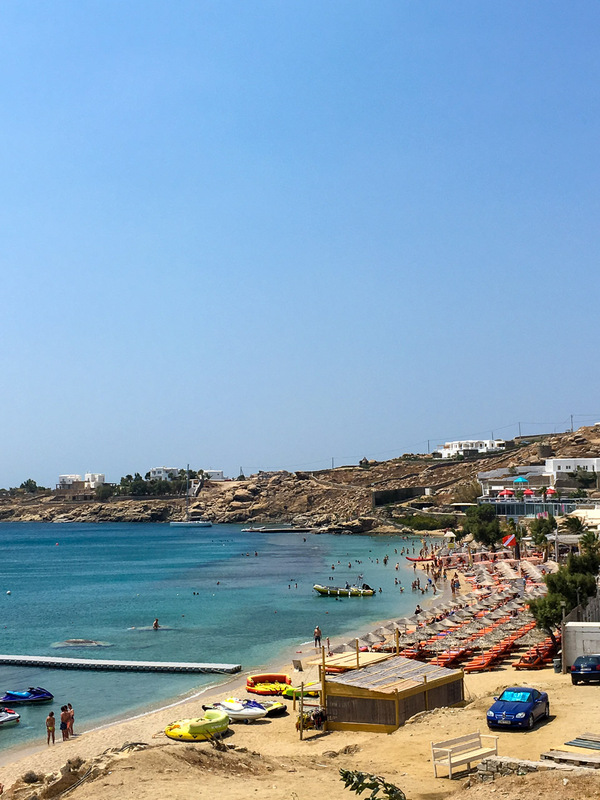 Elia – One of the largest & nicest beaches in Mykonos. It is a beautiful beach, just a short boat ride away from Paradise Beach, with many sunbeds, a restaurant and of course, crystal clear water. 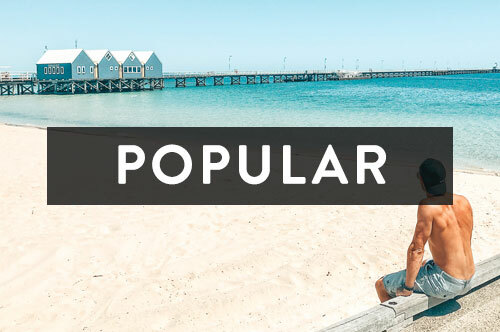 This beach is also popular with the gay population and with a much quieter atmosphere. There is parking if you have a car but otherwise, once the sun goes down it can be a logistical nightmare to get anywhere. You’ll find very upmarket hotels on the cliffs of Elia Beach. 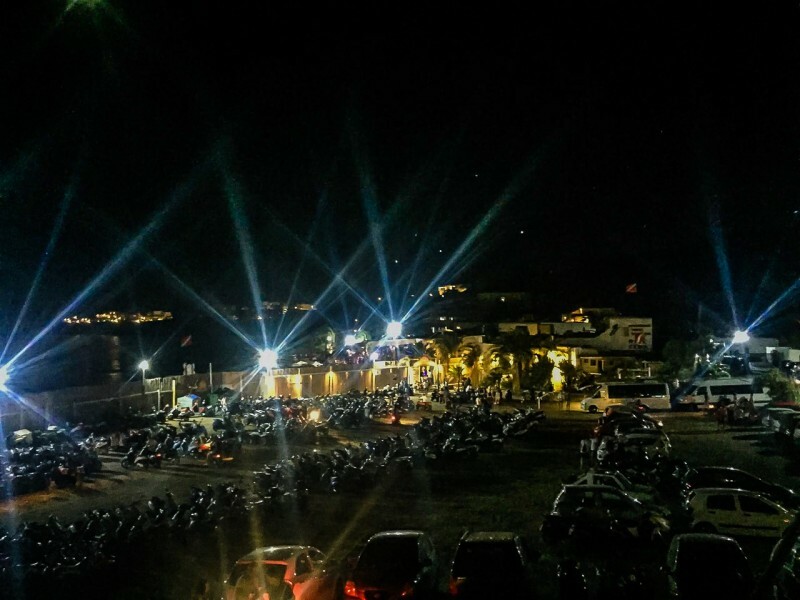 Paraga – Paraga is just a small village with some restaurants on the beach, a supermarket and a big camping area, however hostels and apartments are also available. Buses run to and from Mykonos town to Paraga, along with boats to the nearby beaches. Parties occur on one side of the beach in the afternoon but the beach is split into two so you can find a quieter area as well. 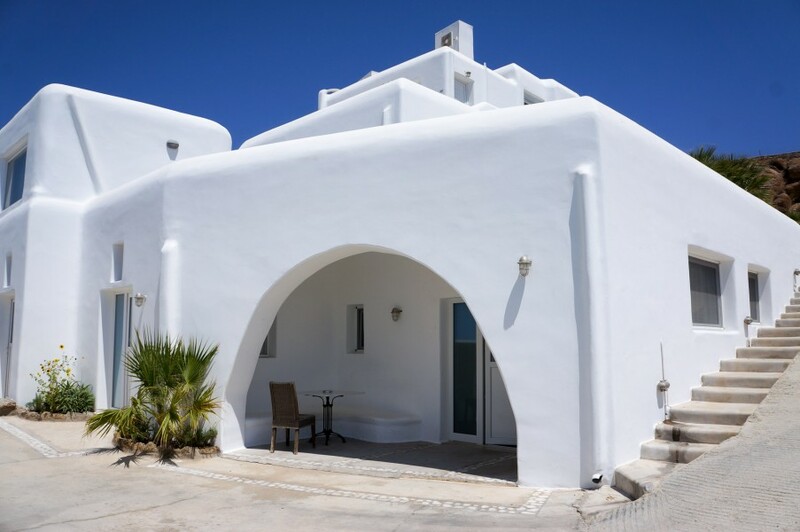 Ornos – Ornos is a good option for people that want to stay at a beach yet don’t want accommodation too far from Mykonos Town. Ornos has regular bus connections to Mykonos town. It also one of the largest selections of restaurants along the beach so you don’t have to go far to find somewhere to eat. Super Paradise – Super Paradise beach is yet another beautiful beach and has the afternoon parties similar to that of Paradise Beach. It isn’t as easily accessible with a car but boats do run here up until 6:45 pm. Accommodation near the beach can be noisy due to the clubs. It is recommended to rent an ATV or car to better access other parts of the island after the boats have stopped. Super Paradise is also popular amongst the gay population. Mykonos Town (Central) – You have many choices for places to stay along with choices of restaurants and bars but during the days it can be hot. Mykonos town is where you will find the best shopping. 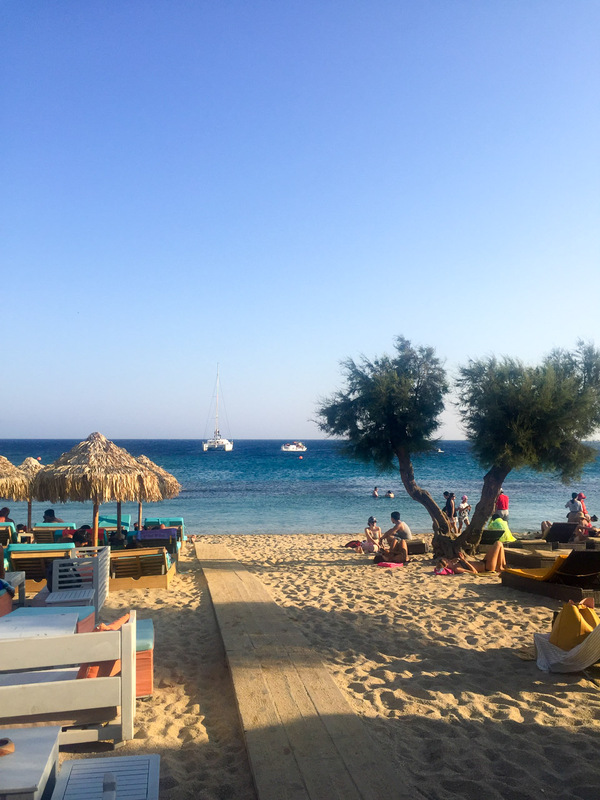 Note: Don’t forget to also check out Airbnb in Mykonos, there was a surprising amount on the island. Buses – There are buses that run regularly from Mykonos town to a selection of the beaches. Its 1.80€ one way and they generally run on the 30 minutes. Taxi’s – Not the most reliable form of transportation but they are available. Don’t rely on them late at night. 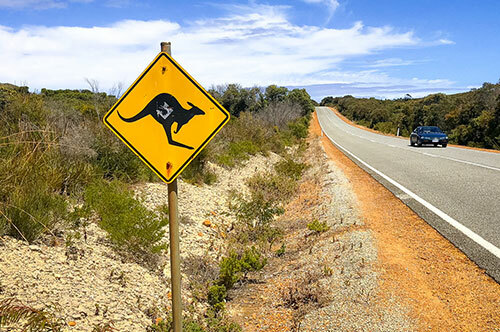 Car Rental – Parking can be a nightmare unless your accommodation provides space to do so. 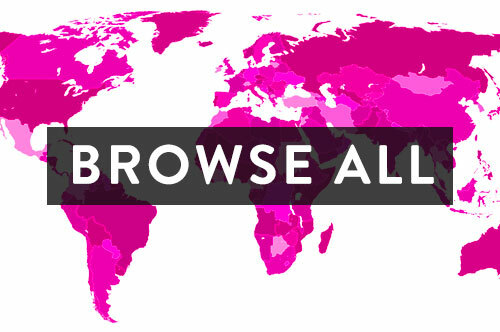 Be sure to check. Don’t drink and drive! ATV/scooters – A lot of people rent ATV’s or scooters but there are no rules and regulation in terms of drink driving so it can be very dangerous. (I sound like a mother!). You will see ATV’s flying by till all hours of the morning. The roads are windy and narrow so if you rent one, be careful! There are many drunk drivers on the road. Taxi Boat – Jump on the taxi boat which goes between 6 of the beaches on the south of the island. You can hop on and hop off as you like. The only downside is the last boat back to your chosen beach is at 6:45 pm and if you miss it, it could be a struggle to find an alternative so watch that watch! We took the boat from Paradise beach –> Elia –> Super Paradise Beach –> Paraga Beach and walked back to Paradise beach (10 minutes). Cost 15-20€. 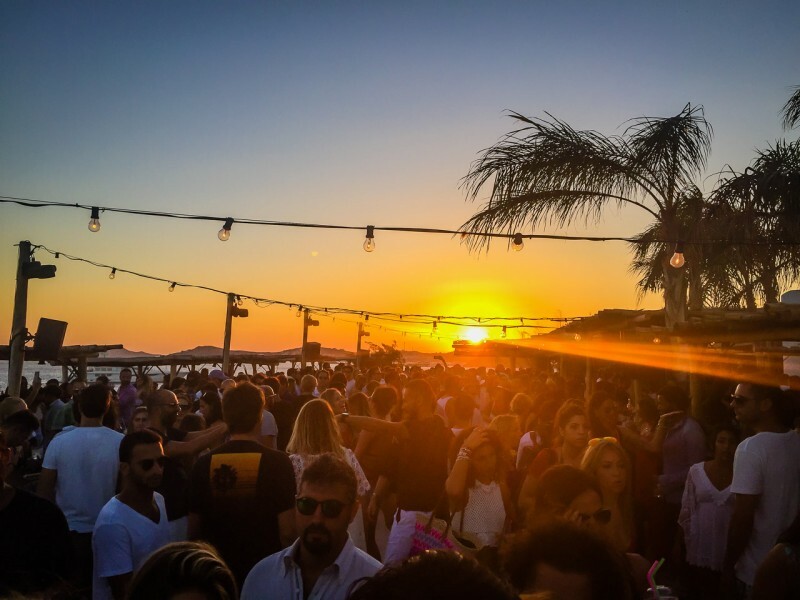 There is absolutely no shortage of partying in Mykonos. We ventured out of Paradise beach a few times this year and explored around. By doing so, we came across some really fun places. We wish we had known about these during our last trip but I am glad this year we were able to enjoy them with friends. 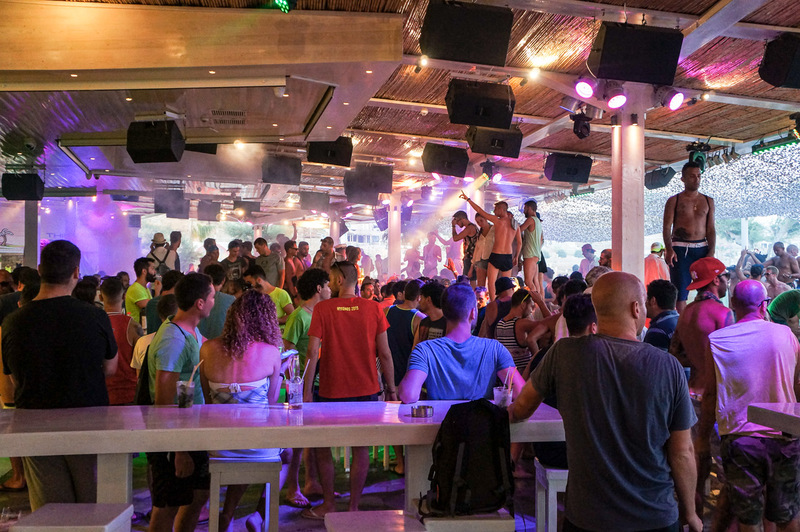 Paradise Club – Paradise is open every other night with big name DJ’s during the summer months. There is a pool in the centre of the club but unfortunately at night due to safety reasons, swimming isn’t allowed so don’t be tempted ;). Tickets can be bought the day of from promoters roaming the beach. Tropicana Club – Tropicana gets going from 4:30pm onwards. The bar turns into quite the beach party with the music starting gradually in the afternoon. By 12am, it’s in full force. 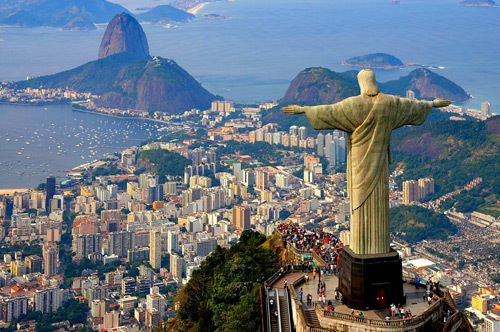 During the month of August, the majority are Italian tourists. 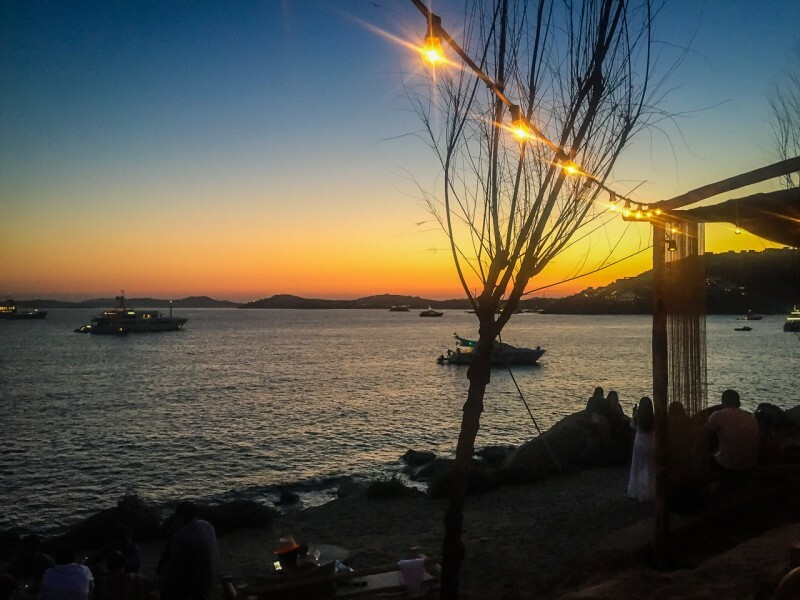 Cavo Paradiso – One of our favourite clubs on the island. 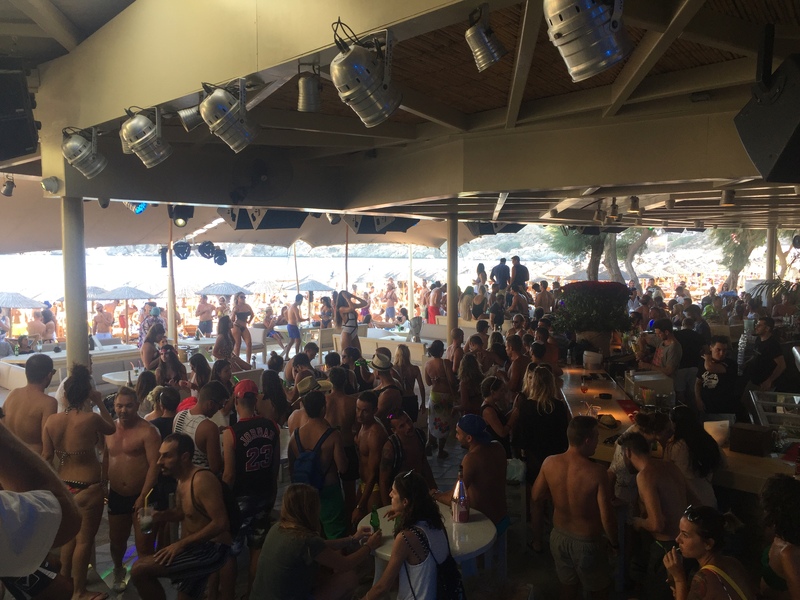 The club brings big name DJ’s, is located right on the water with views of the sea and can get very crowded (in a surprisingly good way). The drink prices are rather steep and the lines to get in can be long. We suggest going early, grabbing a stamp and coming back later. Always buy your ticket before getting there, it’s almost half the cost. 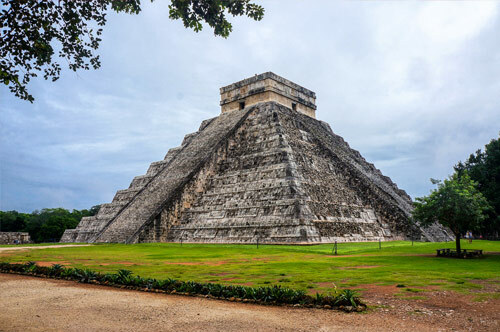 Guapaloca – This day party gets going at 4:30pm until after midnight. 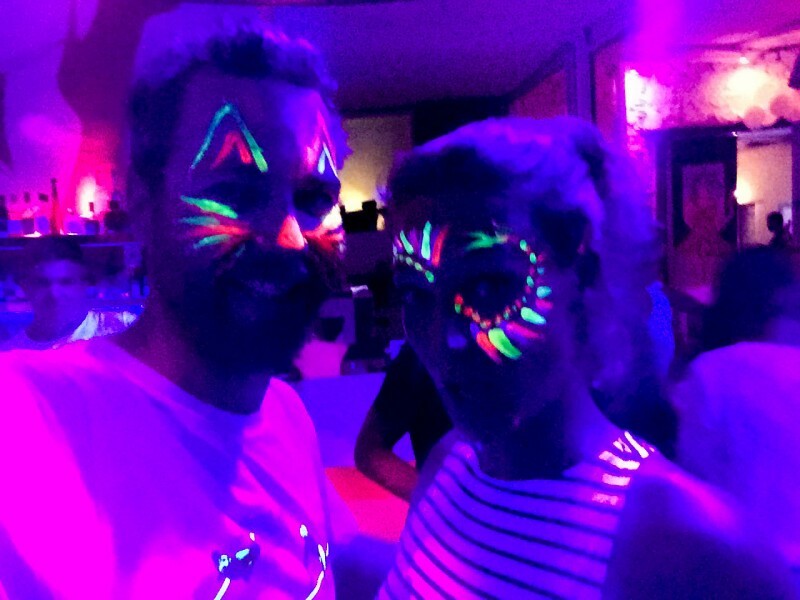 Some nights they have white parties with fluorescent face paint, others a Latin or RnB nights. Large choice of happy hour cocktails until midnight. 2 for 1. 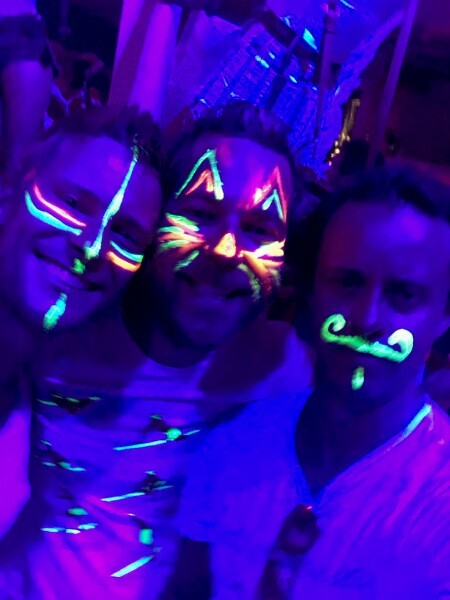 Jackie O’s – A very popular gay bar with an awesome overview of super paradise beach below. Drinks are poured well and there is a swimming pool to enjoy. We stopped here for the views, some drinks and for the opportunity to take some photos. Pinky Beach – A more relaxed day bed vibe. 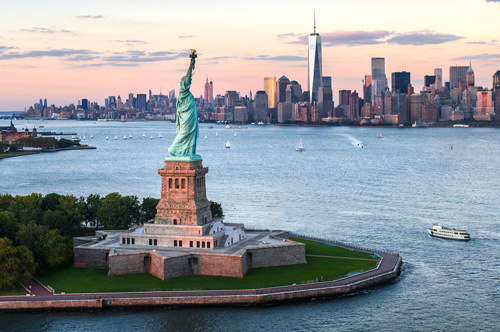 They can be rented with bottle service and it is considerably more chilled than the surrounding parties, yet still an awesome place to spend an afternoon. Super Paradise Beach Club – Similar to that of Tropicana but with a higher gay population and slightly more expensive. Scorpios – Scorpios, only open since 2015, is located in between Paraga Beach and Paradise Beach and is a must visit when you head to Mykonos! The crowd here was entirely different to that anywhere else on the island and the price tag shows. However, don’t be deterred. The food at the restaurant was outstanding but be sure to make a reservation. During the summer, their main parties are on Tuesdays, Thursday and Sundays so expect large (but good) crowds. 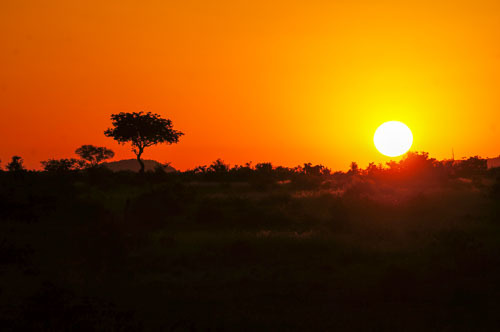 Try to get there by sunset, it’s beautiful! Warning: The cocktails don’t come cheap! 25€ for an Aperol Spritz… Yikes! 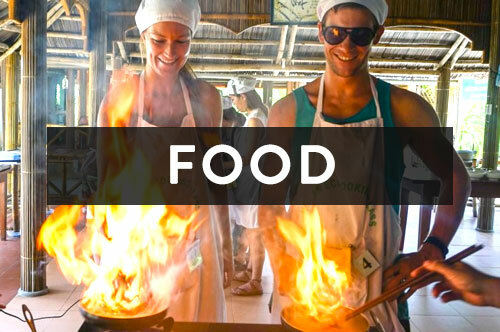 Kalua – For a more upscale, less crazy beach party, Kalua has it all. 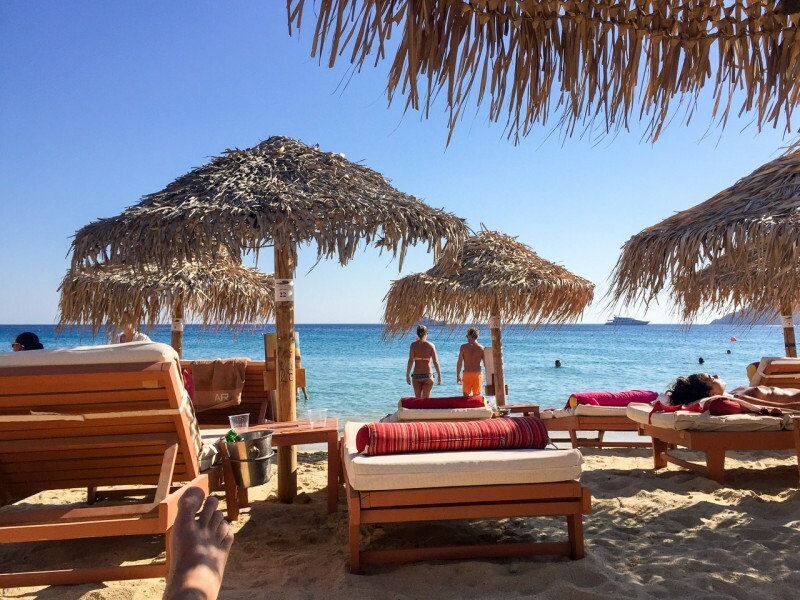 Located on one of the smallest beaches in Mykonos. Cheap food/drinks and very affordable beach chair rentals. Doesn’t get going until after 4:00pm. 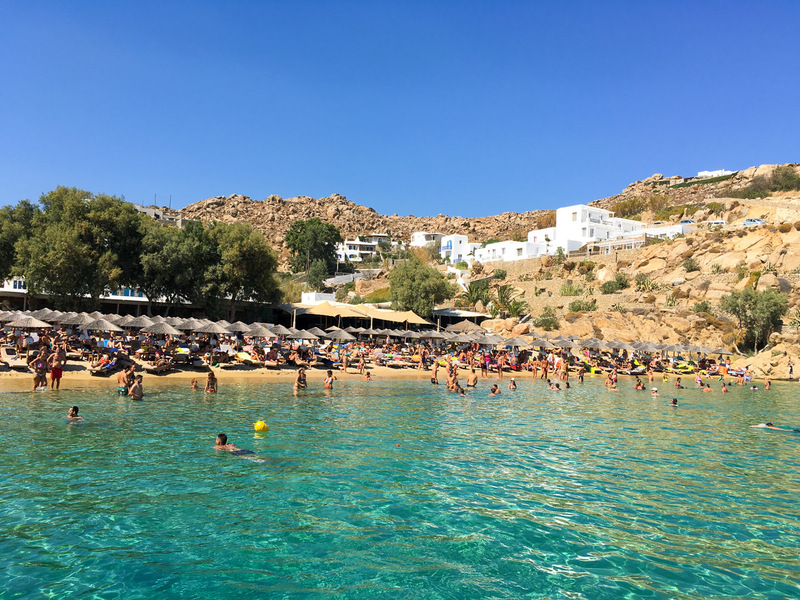 Mykonos town has ample restaurants and bars to fill every need, however, we spent most of our time by the beach clubs so it is hard to give a valid opinion. 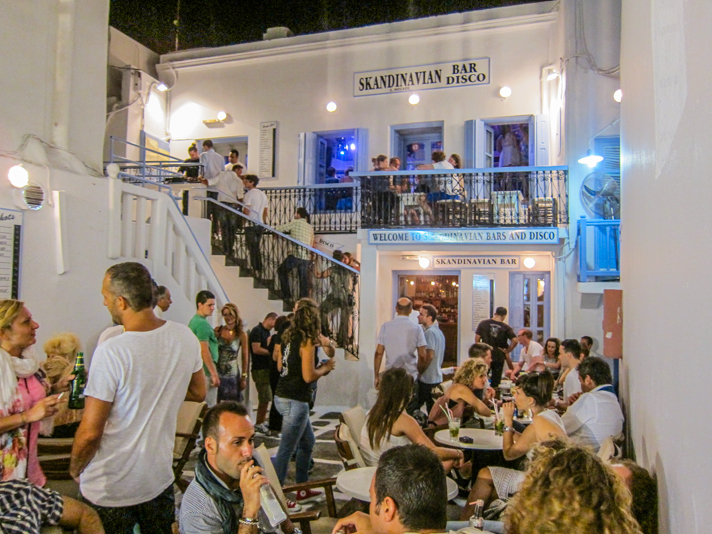 However, from further recommendations of the best bars in Mykonos Town, Scandinavian Bar and Queens bring in a great crowd. Mykonos definitely didn’t disappoint and it was even better spending it with the company we did. 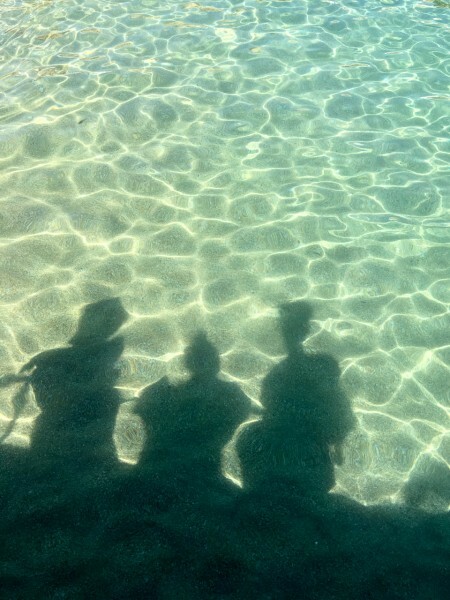 We laughed and drank until all hours of the morning, while still spending ample time on the stunning beaches. 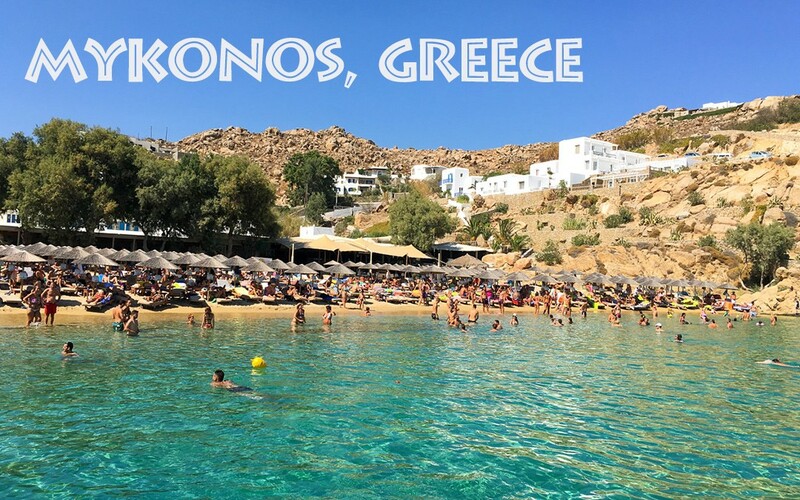 Have you been to Mykonos? 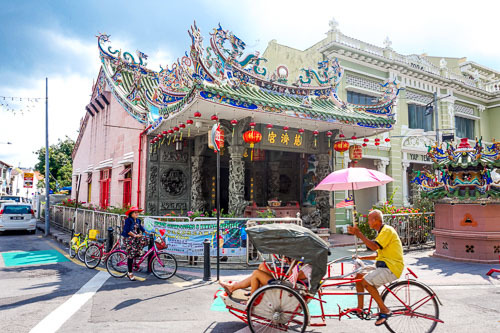 What’s your favourite place to visit on the island? me especially what I’m up for never been that far in my life, this is a great read.. Thanks for reading. I am glad you enjoyed the read and found the information helpful! 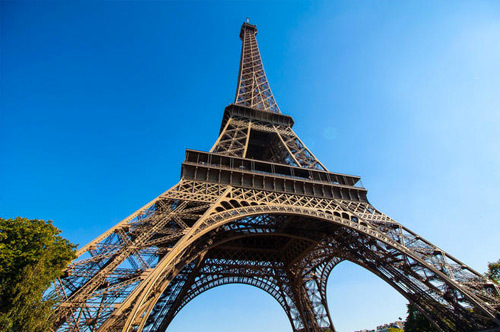 Let me know if you have any other questions for your vacation there! 🙂 Most importantly, have fun! Your photos are all very beautiful and your article very pleasant, I read and like to read other !! Your videos are very entertaining, Hello Kangaroo family !! The move is a matter of fact because there are actually a few taxis on the island! The better solution is to rent a medium one! To rent a car, but if you fear the better to rent a parking a motorcycle! and a My advice to rent a boat and visit Delos! But I agree I do not drink when you drive! Hey, that was a great article, informative and fun to read, kind of virtual tour, the thing is i am from India & getting married on 3rd june and planning my honeymoon around 8th for athens, myokonos & santorini. So do you have any suggestion to make it more special. And does these have any adventure sport sort of thing over there?